Manny Pacquiao vs. Lucas Matthysse Fight Highlights. Eight-division world champion Manny Pacquiao (60-7-2, 39 KOs) dropped Lucas Matthysse (39-5, 36 KOs) three times to claim the WBA 'regular' welterweight title at the 16,000-seater Axiata Arena in Kuala Lumpur, Malaysia on Sunday, July 15th. 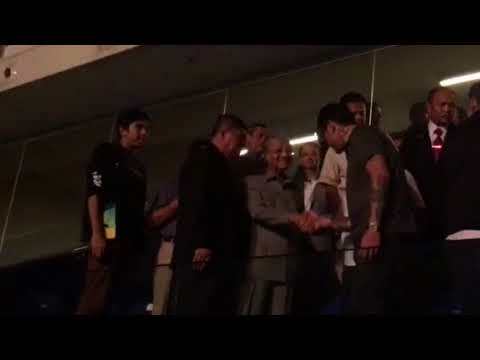 Watch President Rodrigo Duterte’s reaction to Manny Pacquiao’s TKO win over Lucas Matthysse. Malacañang staff confirms Malaysian Prime Minister Mahathir Mohamad also watched the Pacquiao fight. He arrived at the venue during the sixth round.